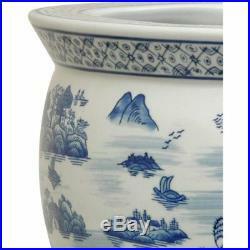 16 Landscape Blue & White Porcelain Fishbowl. 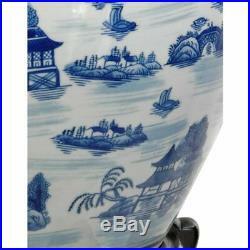 Ming blue and white porcelain fishbowl with a Chinese landscape design accented with mountains and pagodas. An elegant display for Fichus or Avocado trees, live house plants, live or cut flowers, and silk or dry flower arrangements. Compliments both traditional and contemporary interior decor. Large, solidly crafted Chinese vitreous porcelain fishbowl. Planter pot, floral display, or decorative accent. Note: no drain in bottom. Hand-applied oriental landscape pattern in classic Ming blue and white. 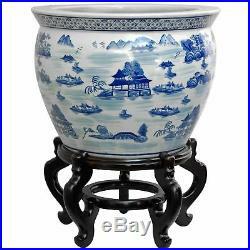 16" Diameter x 12.75"H.
The item "Oriental Furniture 16 Landscape Blue & White Porcelain Fishbowl" is in sale since Tuesday, August 15, 2017. This item is in the category "Home & Garden\Home Décor\Decorative Plates & Bowls". The seller is "orientalfurniture" and is located in Cambridge, Massachusetts. This item can be shipped to United States, Canada, United Kingdom, Denmark, Romania, Slovakia, Bulgaria, Czech republic, Finland, Hungary, Latvia, Lithuania, Malta, Estonia, Australia, Greece, Portugal, Cyprus, Slovenia, Japan, China, Sweden, South Korea, Indonesia, Taiwan, South africa, Thailand, Belgium, France, Hong Kong, Ireland, Netherlands, Poland, Spain, Italy, Germany, Austria, Israel, Mexico, New Zealand, Philippines, Singapore, Switzerland, Norway, Saudi arabia, Ukraine, United arab emirates, Qatar, Kuwait, Bahrain, Croatia, Malaysia, Brazil, Chile, Colombia, Costa rica, Dominican republic, Panama, Trinidad and tobago, Guatemala, El salvador, Honduras, Jamaica, Antigua and barbuda, Aruba, Belize, Dominica, Grenada, Saint kitts and nevis, Saint lucia, Montserrat, Turks and caicos islands, Barbados, Bangladesh, Bermuda, Brunei darussalam, Bolivia, Ecuador, Egypt, French guiana, Guernsey, Gibraltar, Guadeloupe, Iceland, Jersey, Jordan, Cambodia, Cayman islands, Liechtenstein, Sri lanka, Luxembourg, Monaco, Macao, Martinique, Maldives, Nicaragua, Oman, Peru, Pakistan, Paraguay, Reunion, Bahamas, Viet nam, Uruguay.